Awesome Aran is our 100% homegrown British wool and we love it for being a great all-rounder – soft, warm and easy to care for. It’s spun in England from only the finest wool that the Bluefaced Leicester sheep produces. It’s been great fun to develop a colour range for as it has a unique lustre that adds an amazing depth to hand-dyed colours. 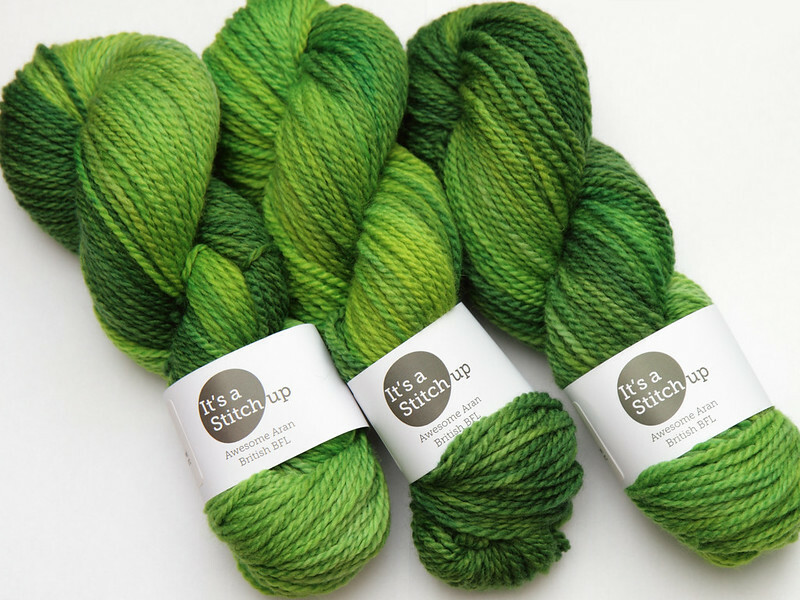 But, seeing new shades come out of the dye pot is nothing compared to the excitement of seeing real-live FOs from the knitting community, and we’ve got a couple to share! 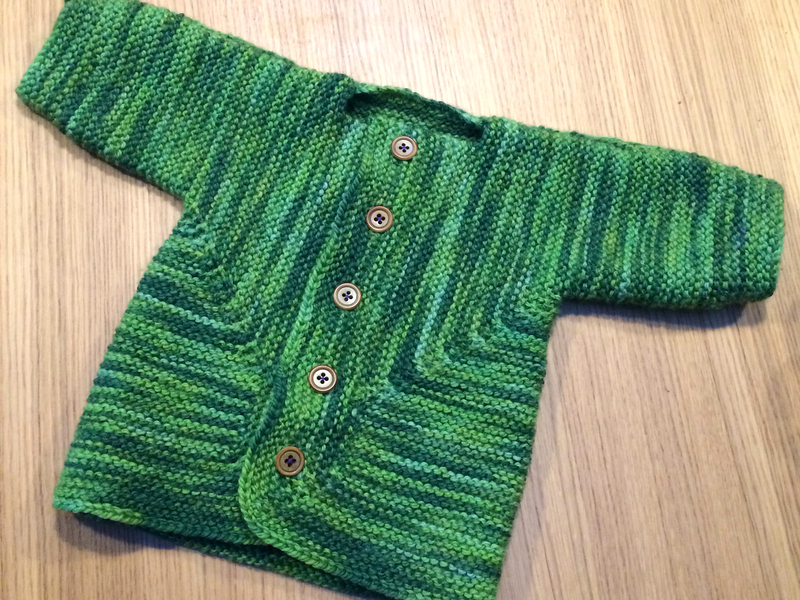 The first comes from designer Liz Triskellian (check out her ‘Dylan’s Elephants‘ baby cardigan pattern). Her Baby Surprise Jacket was knitted in Suffragette Green, which started out as an exclusive colour developed for a group but proved so popular we added it to the stock range. £1 for every skein sold being donated to Refuge. 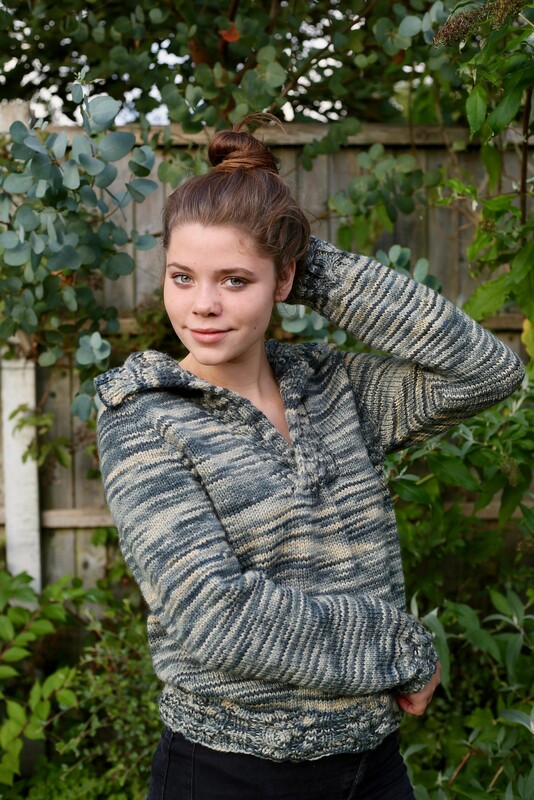 The pattern is the perfect way to showcase hand-dyed yarn. 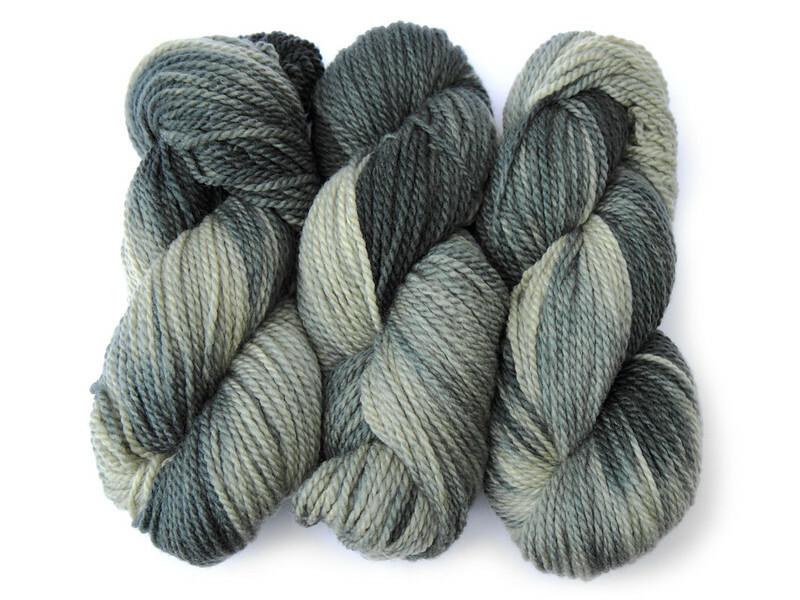 Especially this one – which hovers between being a semi-solid and variegated shade, having been created by dip-dyeing each skein in four different greens. This superb sweater was shaded with us by Anna in Newcastle, and is knitted in Awesome Aran shade Iskald. The project is based on a free pattern Amused by Jordana Paige, but Anna made a few mods including lengthening the sleeves and adding cables to the cuffs and lower edging. She did a super job on this, it looks so cosy! The Iskald colourway was inspired a winter trip to the misty Norwegian fjords, and translates as ‘icy’. 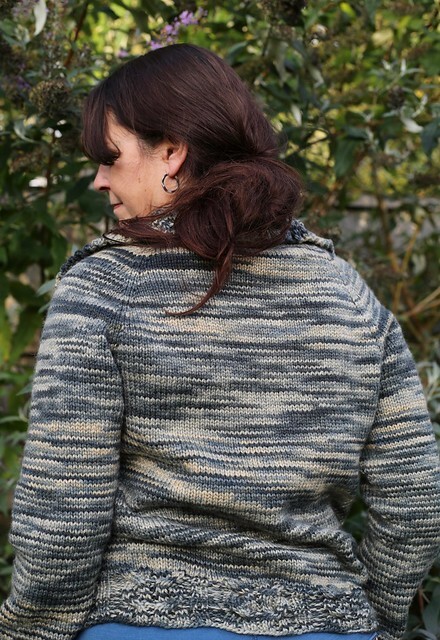 Anna’s project is proof that variegated shades can look fantastic used on larger garments. We’ve been focusing a lot of our attention on Awesome Aran lately – not only working on developing patterns (like Shipwreck Cove) to show off its beautiful qualities, but also expanding the shade range. New for autumn is Corn on the Cob, a semi-solid golden yellow. 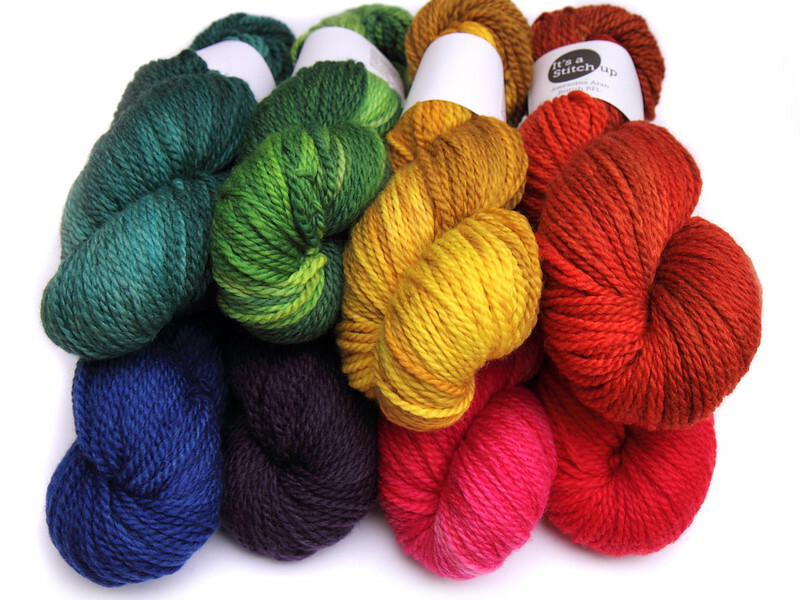 …Which just happens to complete the Awesome Aran rainbow! If you’re looking to make a sweater or larger garment in Awesome Aran, you might find that we don’t have quite enough in stock. Fear not! We take custom orders for most shades. 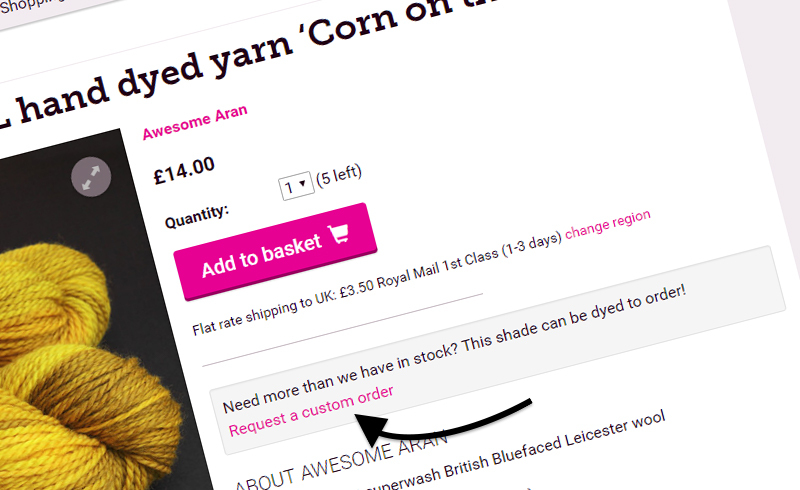 Choose your shade and you’ll see a link to ‘Request a custom order’ on the product page. There’s a short form to fill in to tell is how much you need and where it needs to be shipped to. 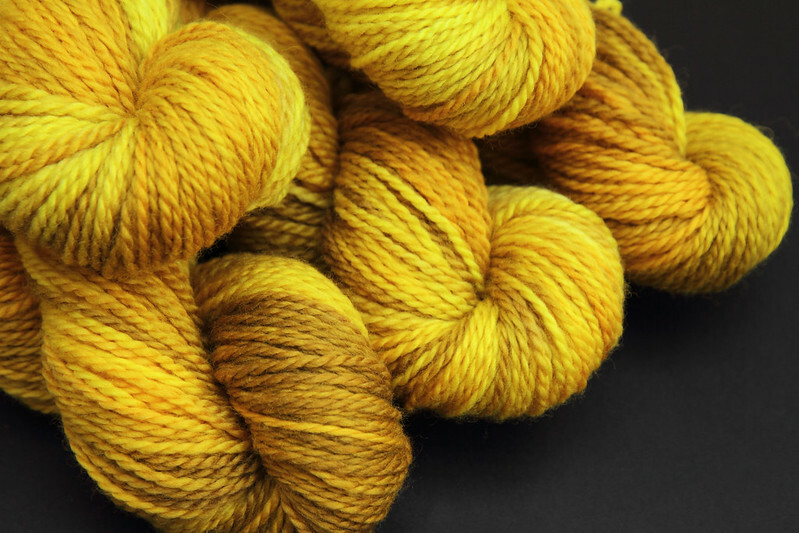 We’ll respond and let you know how soon we can dye your yarn (normally within two weeks) and what the total cost will be (there’s no obligation at this point). We wish we had the space to keep larger quantities of each shade in stock, hopefully soon! Please keep your FOs coming – share them in our Ravelry group, Facebook page or mention @its.a.stitch.up on Instagram.